Astronomy is an imprecise business, and much of what skywatchers see depends on what tool they're using to look. In 1610, Galileo became the first person to spot the rings around Saturn, but through his early telescope, they looked like a pair of moons, or even handle-like formations. "I have observed the highest planet to be triple-bodied," he wrote in his journal. "This is to say that to my great amazement, Saturn was seen to me to be not a single star, but three together." It wasn't until 1655 that Christaan Huygens, using a more powerful telescope, correctly concluded that what Galileo had seen was a ring. Something similar is going on now concerning a very different kind of ring in a very different place, though in this case, the separate findings complement, rather than contradict each other. No matter what, they're turning a once-obscure star named Fomalhaut into a hot topic of cosmic conversation. As Time.com reported last week, Fomalhaut is a young star  as little as 200 million years old, compared to our middle-aged Sun's 5 billion years  located about 25 light years from Earth. 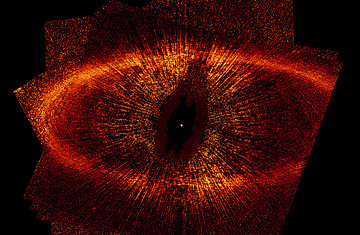 Fomalhaut is circled by a massive ring, which was first observed by the Hubble Space Telescope in 2004 and was assumed to be made of gas and dust left over from the stellar formation process. The star made news so recently because of a new showing that it is also circled by two previously unknown planets  one larger than Mars but smaller than Earth and the other larger than Earth but smaller than Neptune. Exoplanets are becoming increasingly common, but these were special because of the way they were detected: the two worlds orbit on either side of the ring, sharpening its inner and outer edges, much the way pairs of moons around Uranus and Saturn keep those planets' rings tidy. Such so-called shepherding moons were well-known, but shepherding planets are a whole new thing. That ought to be enough news from one star for one week, but a subsequent report from Belgian astronomer Bram Acke and his colleagues, working with the European Space Agency's Herschel Space Observatory, have added an elegant dimension to the Fomalhaut ring. Observations in the infrared spectrum, which is how Herschel sees the universe, suggest that the formation is made up not just of primordial gas and dust, but of fluffy, snowy debris left over from collisions among comets. And since such cosmic frost dissipates fast, the collisions must be occurring all the time  and in enormous numbers. Infrared telescopes work, in effect, by taking the universe's temperature, as opposed to taking its picture like the Hubble does. While the Fomalhaut ring may orbit a fiery star, it does so at such a distance that it is exceedingly cold, ranging from -170 C to -130 C (-382 F to -234 F). The variation in temperature is the result of the fact that the disk is not perfectly centered around the star, meaning its southern half is warmer and brighter than its northern one. The temperature of any ring is determined not just by its proximity to its star, but also by the size of the grains that make it up, and at these temperatures, the Fomalhaut grains must be tiny: just a few micrometers (or thousandths of a millimeter  or millionths of a meter) across. That's way too small to be part of the star's primordial cloud. "We are sure this is not left-over dust from the proto-planetary disk," wrote Acke in an e-mail exchange with Time, "because the radiation pressure of the star pushes such small grains immediately out of the system." To match both the thermal properties the Herschel's infrared sensors observed and the light-scattering properties detected by Hubble's cameras, a great deal of the ring must be made up of icy aggregates of particles similar to those that stream off of comets in our solar system. It would take cometary collisions, however, to produce that much particulate matter spread over that vast an area. And if, as Acke says, such debris would quickly be blown away, it must somehow be getting constantly replaced or the ring would simply vanish. "To be able to collect such a large amount of small dust, we need to infer a small-grain reproduction rate of 2,000 comet [collisions] per day," he wrote. "The blow-out grains flow constantly out of the belt and into space, but we detect heaps of small dust particles, which are being constantly replenished by collisions." For that many crack-ups to be taking place all the time, Acke calculates that there must be a breathtaking 83 trillion comets in the belt. The only reason we don't see them directly is that at a 25-light year distance, they are far too tiny to discern individually, even if the great sweeping ring they produce is visible. Acke concedes that some of the key math here is an estimate. For statistical purposes, the 83 trillion figure could just as easily be 100 trillion, he says. And the 2,000-collision-per-day assumption is based on an average comet size of 1 km (.62 mi.). If the comets are bigger, the collisions would be fewer, but the amount of debris produced by them would have to remain the same. Like most lovely things, the Fomalhaut disk  at least the portion made up of comet fluff  will not last forever. With so many crack-ups occurring every 24 earthly hours, the herd of comets will eventually be culled enough that they can orbit the star without getting in one another's way. That will make Fomalhaut a quieter place but, alas, a plainer place too.